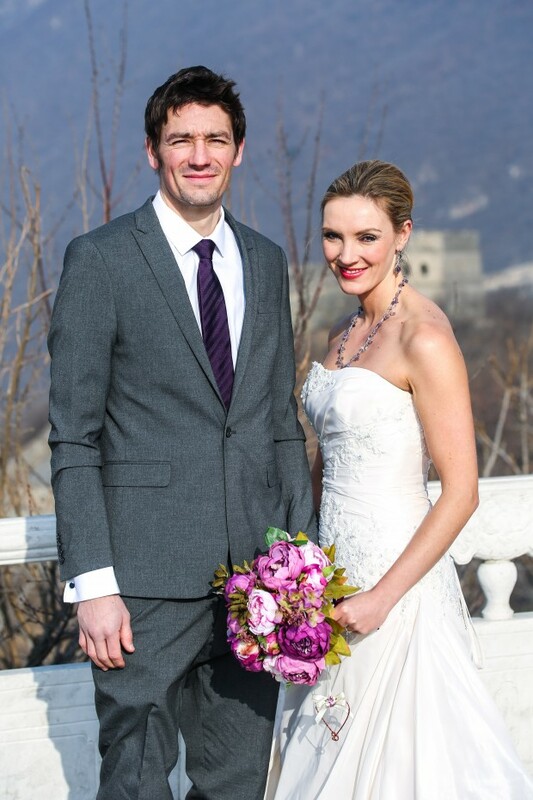 Brett & Amelia's World Wedding Tour: The Great Wall of China, Beijing! 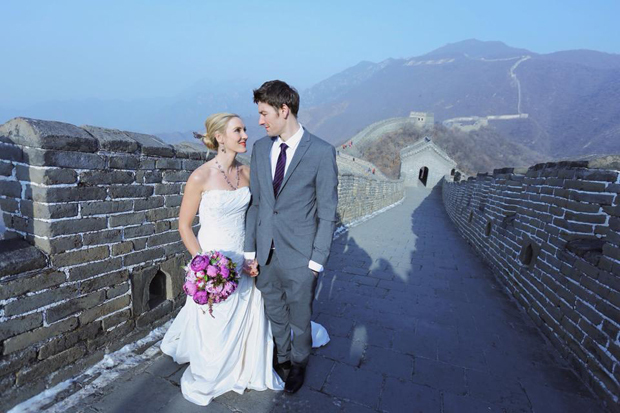 Brett & Amelia’s World Wedding Tour: The Great Wall of China, Beijing! 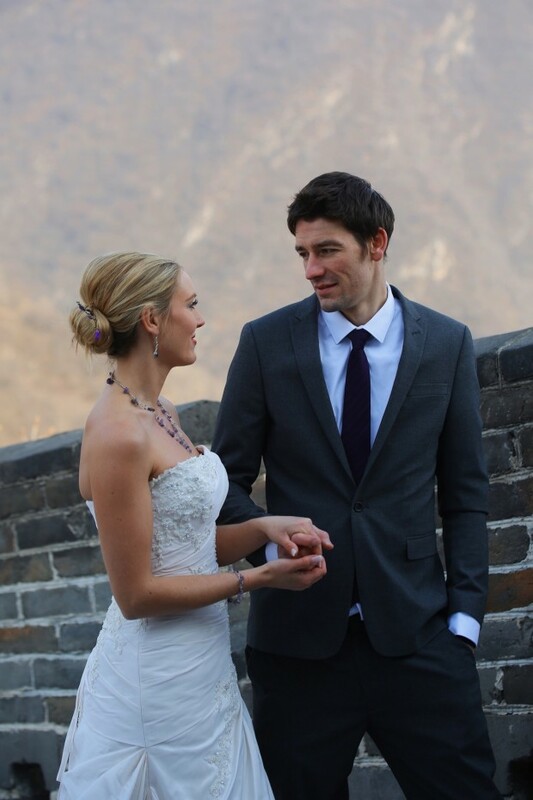 Home > Real Wedding > Brett & Amelia’s World Wedding Tour: The Great Wall of China, Beijing! 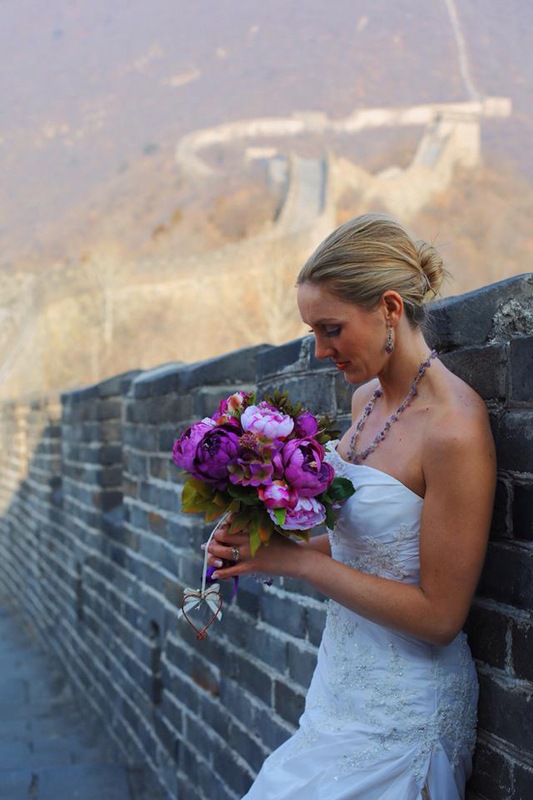 Amelia wore a pretty Enzoani bridal gown and accessorised with the most beautiful purple Peonies – China’s national flower. Words by Amelia. Images by Yu lei. 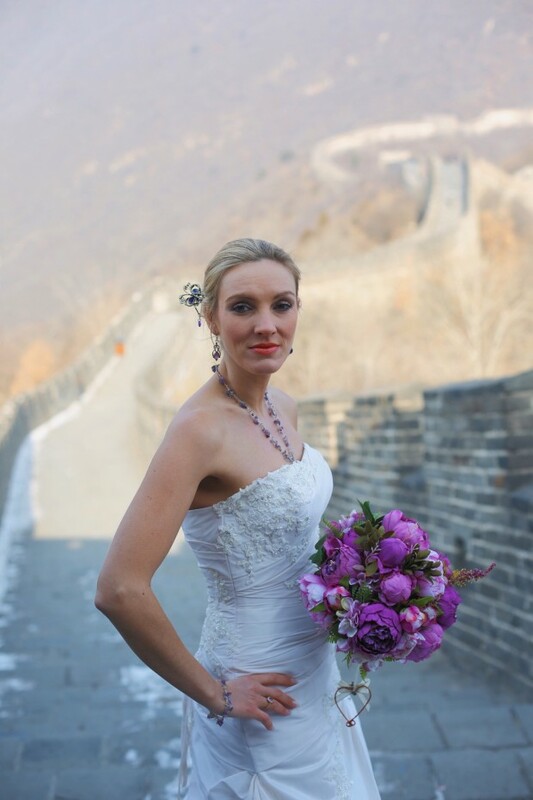 My wedding dress was chosen for the asymmetrical design to flatter against the severity of the wall, and for the chinese beaded floral patterns on the bodice. It’s flattering to wear by hugging the best bits and flowing out at the bottom. I also wore flat white ballet pumps and thermal socks as there was a lot of walking and stair climbing, and the ground was frozen on the top of the wall. My feet were freezing. We woke at 5 am to miss the Chinese New Year festival traffic, and made it to the wall by 8.30. As a result we were the first group of the day up onto the wall, which took a shuttle bus, a fairly steep flight of stairs and a cable car to reach. Wandering through the township at the bottom of the mountain in my wedding dress was again quite surreal, but I am getting used to it! The wall is breathtaking, what struck me most was that it was built so high up on the top of mountains – how the Chinese managed to get the bricks and stone up there, I have no idea. 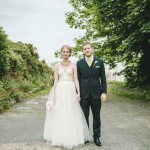 It was very difficult to climb the stairs in the wedding dress and I struggled a lot. Once we reached the top it was very cold, and ice patches were still visible in places. After the wedding, we we had some hot chocolate to warm up; my hands and feet were frozen. I was sad to leave the wall, but we had to get back to Beijing so we could visit the temple of heaven, before catching the bullet train to Xian early the next morning to visit the Terracotta Army. My most memorable moment of the day was reaching the top of the wall and seeing the awe inspiring view of the wall stretching on for miles across the ridges of the mountain tops. All the tourists on the wall stopped to take photos of us. I want to say a massive thank you to Byron Wang for making our dreams come true, and staying by our side to translate throughout our entire day! 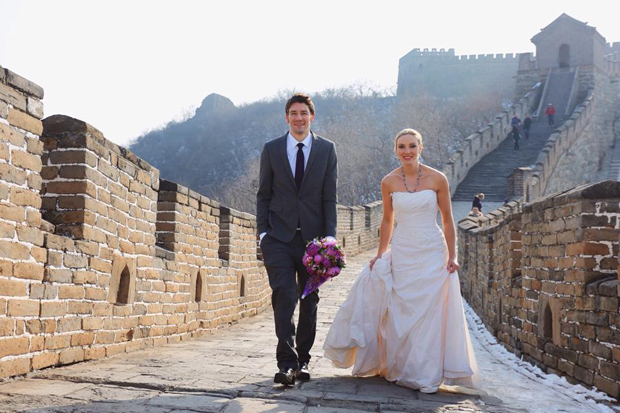 I know you’re reading this, so “thank you!” Anyone else wanting to have a wedding on the wall, should definitely get in touch with him. 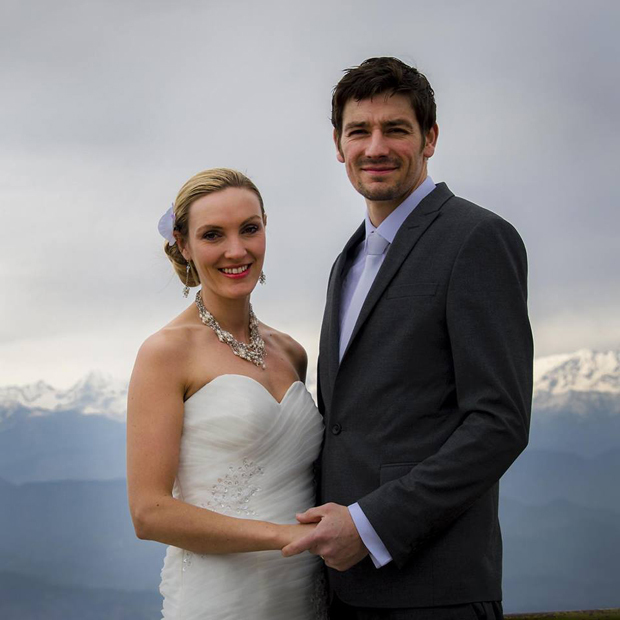 Next wedding Mount Everest, Nepal. 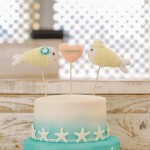 And here is a sneak peek of their next wedding in Nepal!! 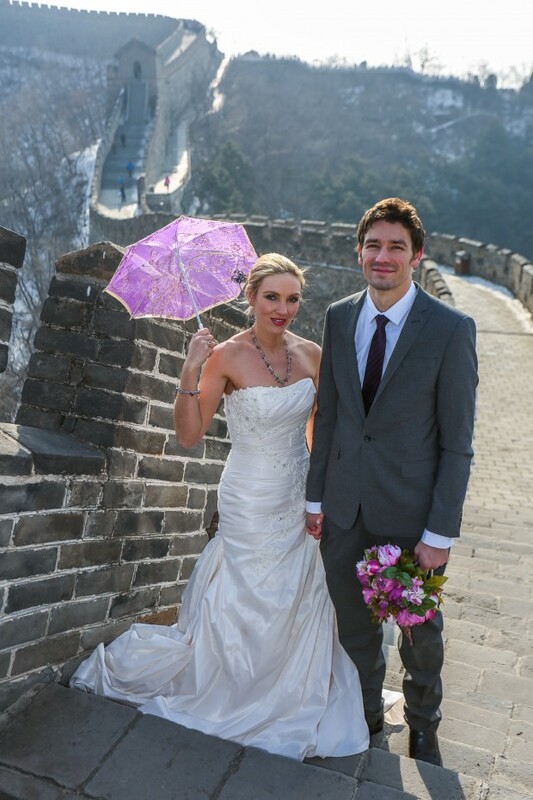 Brett & Amelia’s World Wedding Tour: The Kremlin, Moscow! 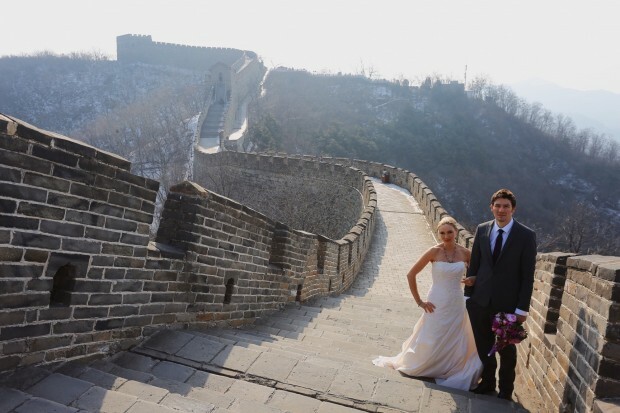 So stunning and amazing wedding pictures, I love the great wall of china.